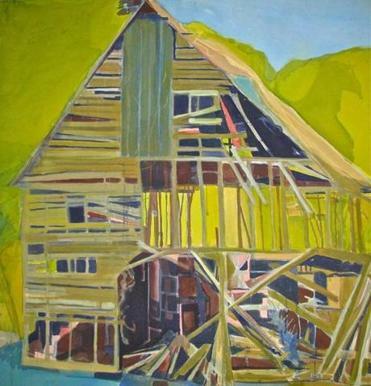 Paintings by Bonita Flore are at The Firehouse Center for the Arts in Newburyport. A COMEDY OF LETTERS John Fogle has staged more than 80 theatrical productions locally, and he’s at it again. “Alphabetical Order,” produced and directed by Fogle, is presented by the Mugford Street Players at Marblehead Little Theatre April 2-19. The play was written by Michael Frayn, who is also the author of “Noises Off,” a farce that had a long run in London and was the winner of the 1975 Evening Standard Award for Best Comedy. The story unfolds in the cluttered library of a provincial British newspaper, where the chaos mirrors the lives of manager Lucy and her associates. Things change when Leslie, a new hire with a passion for organization, arrives on the scene. The cast includes Alex Alexander, Kristine Burke, Brian Casey, Stephen Cooper, Julia Short, Bob Karish, and Mark O’Donald. Set design is by Bruce Greenwald, costume design by Linda Ross, set decoration by Jean Fogle, and lighting design by Greg Mancusi-Ungaro. Anna Stenberg is production stage manager. The Mugford Street Players have presented more than 60 productions in a variety of North Shore locations since the group was founded in 1975 at the Unitarian-Universalist Church on Mugford Street in Marblehead. The group’s mission is to provide challenging, thought-provoking theater and serve the artistic ambitions of its members. Performances of “Alphabetical Order” are 7:30 p.m. Thursdays through Saturdays; 5 p.m. Sundays at 12 School St. Tickets are $25, $20 for students and senior citizens. Visit mltlive.com or mugfordstreet.com. An exhibit of her paintings at is The Firehouse Center for the Arts in Market Square, Newburyport, through March 29. LeFiore retired early from the advertising industry and left New York City to paint full time in New England and around the world. Her paintings are in many private collections in the United States and internationally. TABLE TALK Did you ever contemplate what the early colonists ate for dinner? Scholar and author Rosana Wan explains just that in “The Culinary Lives of John and Abigail Adams” at the Cushing House in Newburyport on Thursday. Wan presents a portrait of early American culinary life documented through the letters and diaries of both John and Abigail Adams. Throughout a 54-year marriage, the couple enjoyed hearty, diverse cuisine in their native Massachusetts, as well as in New York, Philadelphia, and Europe. Raised with traditional New England palates, they dined on cod, roast turkey, mince pie, and plum pudding. These recipes, as well as dishes from cookbooks settlers brought from the Old World, are included in this historical cookbook by Wan. The event, at 98 High St., begins with a reception at 6:30 p.m., followed by the presentation at 7 p.m. Tickets are $15; $5 for museum members. Call 978-462-2681 or visit newburyhistory.org. ON COURSE If you’re itching to practice your golf swing, here’s your chance. The Tewksbury Public Library is hosting an 18-hole, indoor minigolf family event on Sunday, March 22. It wraps up several days of the Tee-Off for Tewksbury fund-raiser to benefit the purchase of new computer for prekindergartners. The event is 10 a.m. to 4 p.m. at 300 Chandler St. Cost is $5. Call 978-640-4490 or visit tewksburypl.org. TWO VOICES Ellis Paul hits the stage at the Me&Thee coffeehouse in Marblehead on Friday, March 27. Paul has won 14 Boston Music Awards, published a book, played thousands of shows, and released more than 16 albums. Rebecca Loebe, one of the contestants on season one of “The Voice,” opens the show. Doors open at 7:30 p.m.; the show begins at 8 p.m. at the Unitarian Universalist Church of Marblehead, 28 Mugford St. Tickets are $22 in advance; $25 at the door. $10 for students. Call 781-631-8987 or visit meandthee.org.